That whole day, being with Willem, being Lulu, it made me realize that all my life I've been living in a small, square room , with no windows and no doors. And I was fine. I was happy, even. I thought. Then someone came along and showed me there was a door in the room. One that I'd never even seen before. Then he opened it for me. When Allyson Healy takes a trip to Europe with her best friend Melanie the summer before her Freshman year of college, she quickly discovers that most of the trip is drudgery: filled with schedules, a motherly tour guide, and tourist trap after tourist trap. But close to the end of their trip, in Stratford-Upon-Avon, Melanie and Allyson ditch their tour group to attend an underground performance of Shakespeare's The Twelfth Night. That is where she sees Willem for the first time, a ruggedly handsome Dutch actor performing in the play, and there is an irrefutable spark. So when their first chance encounter leads to a second, Allyson decides to ditch her normally good girl persona and take a risk, choosing to run off to Paris with Willem for the day. That decision vaults her into one of the most tumultuous years of her life, filled with angst and self-discovery, and perhaps even some love along the way: love of herself and of others. True to Gayle Forman's touching, sentimental style, she writes a page-turning narrative full of heart and soul in Just One Day. I must admit, I was a bit dubious of Allyson's intentions midway through the novel, and even found her to be a tad too emo and angsty for my liking. At certain points of the story I even found it extremely difficult to empathize with her. But I should not have doubted. Forman once again proves her writing chops and shows her readers how to truly craft a three-dimensional character. There were so many beautiful moments in this book, and they all revolve around Allyson's journey of self-discovery. The friendship she forms with the vibrant and flamboyant D'Angelo Harrison - AKA, "Dee" - is one of the most endearing parts of the novel and helps keep the plot moving. Dee is the perfect example of how a secondary character could steal the show, and would have, if plotted incorrectly. But in this case, he came in, did his job (offered some lightheartedness to some otherwise dark and dismal scenes) and then left Allyson to do the rest. Equally as compelling is Forman's use of travel as self-discovery (which I am obviously a big proponent of given the theme of my blog). There is a particular scene in the book where Allyson is in Paris and she enters a patisserie where there is much celebration and the people inside ask her to join them even though she doesn't know a soul in the room. Her reaction to the events that unfold along with the reason for the celebration proves to be one of the most beautiful and memorable scenes in the book, and a perfect case for why people should travel the world: to seek out those beautiful, unexpected moments that you can't get from, as Mark Twain would say, "vegetating in one little corner of the earth all one's lifetime." Given that most people who have put this book on their to-read list know that there will be a second book told from Willem's point-of-view, the ending shouldn't be too much of a surprise. Though I have to admit, I'm glad we don't have to wait a year to read Just One Year, since the planned publication appears to be some time in 2013. I for one will be one of the first people clamoring to read it. 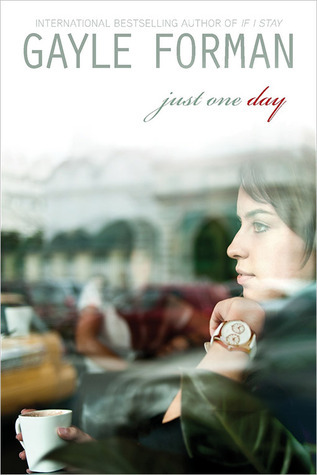 If you're someone like me who loves tales of travel and self-discovery, put Just One Day on your to-read list today! Oh you had me from Stratford upon Avon! :) Sounds great!